To attract visitors, townspeople often arrange a museum in honor of the life and achievements of their native sons or daughters. The memorial for James Dean covers most of the first floor of the Fairmount Historical Museum. Born in 1931, Dean lost his mother when he was 9 years old. His father was in the military and, because he rarely saw him, Dean moved in with his uncle and aunt in Fairmount until he graduated from high school. Dean was a good entertainer and clever at getting his way much of the time. In some ways, he appealed to an entire generation of modern youths who coped with angst and wanted to find ways to enjoy life that fit individual needs. For example, he disliked farm tasks, so he would invite his friends to come over and would direct them to do some of those jobs, which didn’t always fit the expectations of his uncle and aunt. Dean was the first actor to receive a posthumous Best Actor nomination, for his performance in “Rebel Without a Cause.” A year later, he received a second nomination for his role in “Giant,” which was released after his death. He remains the only actor to have two posthumous acting nominations. His struggles and skills as a young man influenced an entire generation. Our guide, Mike Davis, a retired law enforcement officer, stressed how important a movie star Dean had been and how his fame had continued after his death. Dean has remained such a popular character that the annual September weekend festival honoring his life draws 50,000 fans to Fairmount, a town of 8,000. The American Film Institute has listed him as No. 18 of 25 greatest male legends in American film history — between Kirk Douglas and Burt Lancaster. When the readers of Variety magazine in 2005 voted on the most influential actors of the past 100 years, they chose Dean as No. 7 on that list. When the post office decided to create stamps of the “Legends of Hollywood,” James Dean was the second stamp series issued. Marilyn Monroe was on the first stamp series in 1995. Around the world, about 1,500 products bear his name. At the museum, the main display consists of memorabilia from his life along with his first and last motorcycle. He also was an artist, and some of his work is on display. A cement form has his foot and hand print and is set up like those from Hollywood’s Walk of Fame. When he created it at age 12, he said it was what he would have in Hollywood when he became famous. The town had problems at the local Park Cemetery with people taking souvenirs from his grave, and we were told that fans still mark his tombstone with lipstick to show their appreciation. We could have taken a walking tour of 10 attractions in Fairmount, including James Dean Memorial Park. Turning to Fairmount’s other celebrated son, Jim Davis, in a small room, we studied his collection of cartoons, starting with some of his original cartoons based on a talking bug. After a number of years of minor responses, he decided that a bug was not going to become a popular character and turned to cats. The collection of older cartoons shows the development of “Garfield.” who evolved over the years into the striped, bad-tempered, lazy feline we know from daily cartoons today. “Garfield” has become an international phenomena widely franchised with many products using his image. The famous cat has been the star of several CBS TV specials, Bill Murray did his voice in a movie, and 60 million “Garfield” books have been published worldwide. The carefully selected items show what a giant attraction Davis has created. 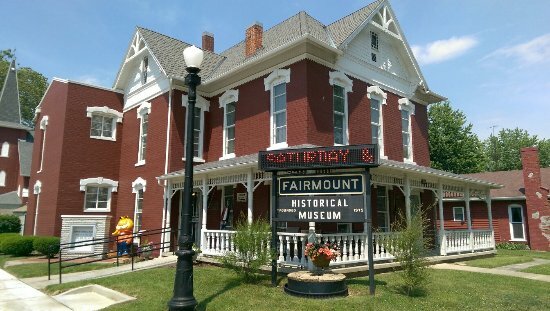 The museum, open from May through November, gets no governmental support but is maintained by locals who take pride in the community’s history.